It’s rare to go behind-the-scenes of a seven-figure company. But today, I’m going to pull back the curtain and show you how a seven-figure company grows — and our exact marketing plan template for launch. I want you to see that what a seven-figure company does to grow isn’t magic. Instead, it’s something you can replicate. To make our simple 14-step marketing plan template even more accessible, we didn’t use any paid advertising. Every marketing strategy we used is 100% free. And because I’m sick of reading long blog posts, you’ll learn the marketing plan template in less than 500 words. As the General Manager of KingSumo, my job is to help KingSumo grow. As a bootstrapped startup, we didn’t have tons of money to use on paid advertising. Instead, we had to use free marketing methods. The good news is, these marketing methods are available for you to use, too. You don’t have to drop thousands of dollars on tools or ideas. Start backwards. We wanted to get 1,000 signups to the new KingSumo. We started with that goal and worked backwards. What methods could we use to reach 1,000? What previous marketing methods have we tried that have worked well? I learned this method from early Facebook employee, and CEO of Sumo Group, Noah Kagan. List all the free marketing methods you can imagine. We started our marketing plan template by writing down the best marketing methods we’ve used, based on previous marketing methods we tried (plus some new ones we brainstormed and were excited to try). Add your numbers by guesstimating. Chad Boyda, the CEO of Sumo, shared a tip about modeling growth recently: You take your best guess, then update the model as you get more information. Many of these numbers were filled in from similar launches I’ve done in the past, which is why they’re so accurate. And based on the new actuals we see above, I’ll be able to make an even better marketing plan and model in the future. Make sure assignments are clear. You need to know who does the what. After you list out all the action items in your marketing plan template, it’s important to assign them so people know who’s responsible. Track results using utm parameters. To differentiate traffic sources, make sure to track using utm parameters (if you’re using Google Analytics). For example, we wrote a post about viral giveaways on OkDork and made sure to tag the URL https://kingsumo.com/?utm_source=okdpost. This made it easier to track signup sources and fill in the actual numbers. 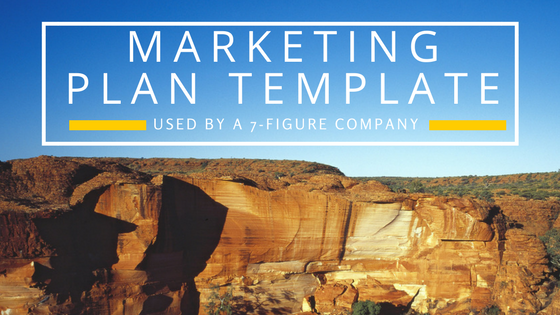 Most people think marketing plan templates are complicated. That’s not true. Even seven-figure companies like KingSumo us a dead simple marketing plan templates to grow. Copy this marketing plan for yourself.